A secret kept by a dead Rabbi. Helsinki is North of Sodom. A taut thriller that delves into international arms dealing and the inheritance left by a dead rabbi. A U.S. envoy is cut down by a sniper’s bullet in the centre of Helsinki. The murder interrupts a relaxing day by the sea for Helsinki detective Leo Asko and his girlfriend Tuva. The apparent hitman is picked up and arrested almost immediately, and the background to the crime is opened to investigation. But Leo Asko isn’t buying it. He has a firm conviction that things are not as they seem: that the man in custody is not the killer. He believes the victim was not quite the innocent and upstanding diplomat he has been taken for, and that there is a larger, international dimension to the case. Daniel Janovsky, now seconded as Asko’s partner, has inherited the library belonging to Rabbi Jankel Klugman, who died in the first book in Davidkin’s series. Klugman’s effects passed on to Janovsky also include a mysterious and obviously very old coin. Janovsky follows a trail of clues and signs that point towards the menorah that once stood in the Holy Temple in Jerusalem and was subsequently lost without trace. A Rembrandt painting also plays an important role, and it takes Janovsky first to Israel and then to Berlin. In the Holy Land, Janovsky tries to find out about a long-lost girlfriend with a possible connection to the Helsinki diplomat’s murder. Janovsky discovers himself facing forces far beyond his control, as he suddenly comes to, hands tied and floating on a raft in the middle of the Dead Sea, at the place where the ancient city of Sodom is said to have stood. And when you head due north from Sodom, sooner or later you come to Finland. As Daniel Janovsky finally returns to Helsinki, a secret plot is gathering momentum. A plot that could redraw the map of the entire Middle East. Samuel Davidkin’s pacy new thriller is packed with surprising twists in the narrative. 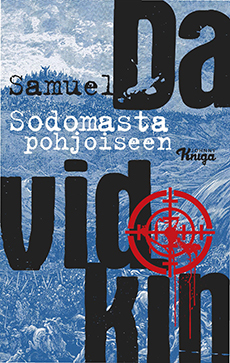 Even though the events of the story carry us far from these shores, Davidkin does not neglect the traditions and cultural history of Judaism in Finland, the slings and arrows of family relations, or the brooding, enigmatic backdrop of Helsinki that he evoked – in a style worthy of Paul Auster – in his début novel, Redemption of the Firstborn (2016).